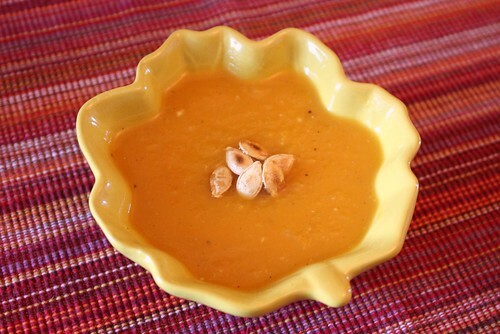 Now that the weather is getting cooler, I love to make nice hot soups to take with me to work for lunches. Making your own soup is a great way to control your nutrition and avoid the high sodium levels found in many store bought soups. It only takes a little while and you can make it one evening while you’re making dinner! 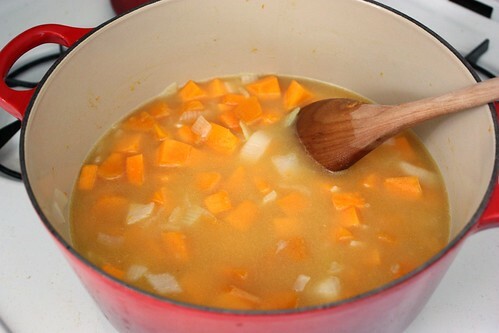 The hardest part of this soup is dicing up the butternut squash, and even that isn’t too hard! Cut it into 1″ cubes. Add in squash, onion and garlic. Sprinkle in a little salt to help the vegetables sweat a little. 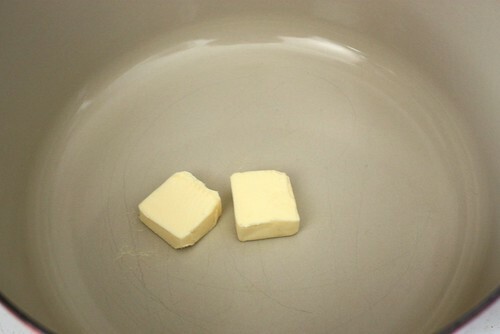 Sauté for 10 minutes, stirring often. Add stock, juice, ginger and freshly ground pepper. 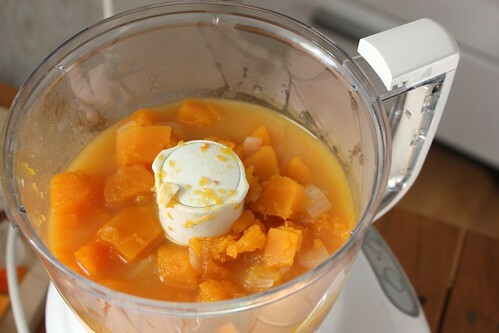 Simmer for 20 minutes or until squash is tender. 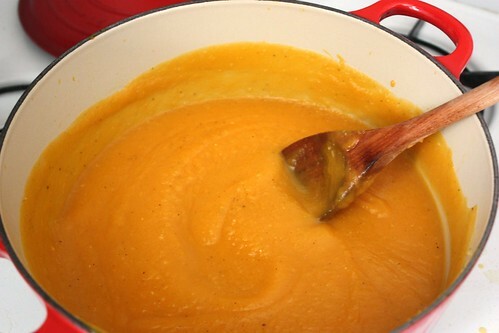 Puree soup in batches in a food processor. 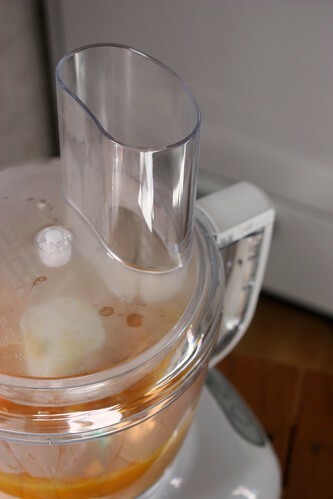 To prevent the puree from splattering, let the heat escape by keeping the hole at the top of your processor or blender clear. 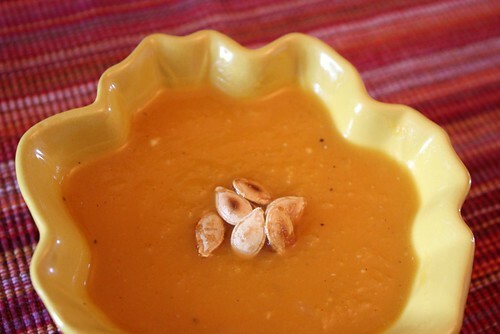 Serve it hot with sour cream or even a few roasted pumpkin seeds. 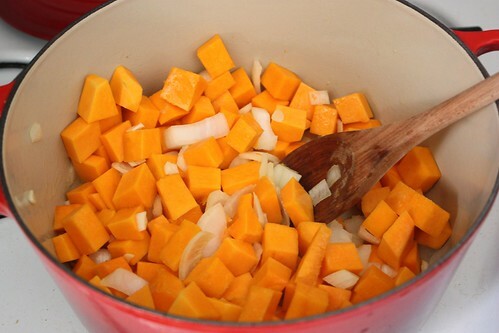 Butternut squash always looks SO yummy to me! I have thought about posting about my “bout” with it. You see, last fall I got it in my head to try a BN soup recipe. So, I’m peeling and cutting and the skin on my hand starts shrinking and then hurting, then I’m having respitory problems, then dizzy… It gets real bad. 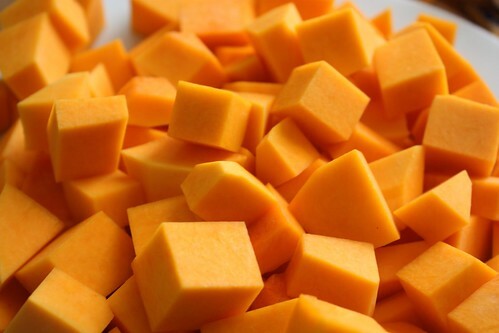 Long story short: Butternut Squash is not a squash. It’s actually in the NUT family. You see, we are a nut allergy family(among other food allergies) Anyways, I had a reaction. So, I tell people about this when I see it… And I long to taste it because the flavors that are in it are so lovely and seem like it would be fabulous! Thanks for linking to Making It With Allie! This looks so good, I am following your blog. Looks delicious and gluten free! Thanks for linking up to Beyond the Picket Fence. After readying your comment I was really intrigued, because I also have a peanut and tree nut allergy. Life threatening in fact. And I’ve never had a reaction to butternut squash before. I looked into this a bit more and saw on wikipedia that it is a type of winter squash (not a nut), but that it has been known to give people “contact dermatitis”, in other words a skin reaction, like you described. Plants that are more common for this are poison ivy and poison oak. Not to say that wikipedia is a reliable source of information at all, but this is something that you might want to bring up with your allergist next time you see them. Im your newest follower! Id love for you to check out my blog http://craftycierra.blogspot.com/ & follow me back! I would love to do a blog swap with you! If your interested, please email me at CierraLarsen@hotmail.com! Thanks!